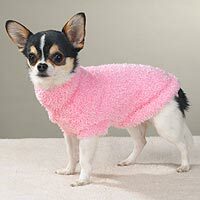 "Think Pink" Sweaters Offer Pets A Warm, Fuzzy Feeling "Think Pink" Sweaters from East Side Collection™ offer comfort comparable to a favorite pair of fuzzy slippers. Easy-fit, bright pink, stretchy boucle-style sweaters feature a lavish look and feel. Design accents include a mock neckline, cropped front sleeves, and fitted, pink hind leg straps. Machine washable in cold water for easy care. "Think Pink" Sweaters are available in the colors and sizes listed below.